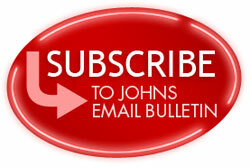 Subscribe to the Johns Email Bulletin and receive exclusive notification of special offers. As a subscriber to our Email Bulletins, you'll get money-saving offers, including occasional special pricing on wash pass 5-packs, seasonal offers and more. You'll also get helpful tips and timely updates — all sent directly to your email box. It's our way of saying "thank-you"; for trusting us to clean your car and for allowing us to communicate with you. In order to prevent unauthorized use of your email address, our subscription form utilizes a "double opt-in" system. That means you'll first receive an email verifying your desire to subscribe; you'll need to follow the simple instructions in that email to complete your subscription.